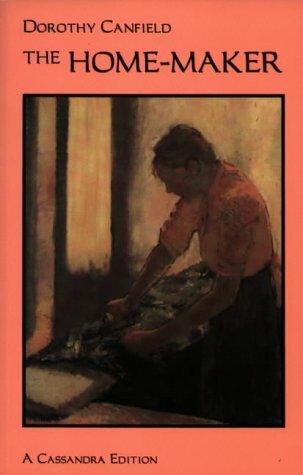 The Homemaker by Dorothy Canfield Fisher tells the story of Evangeline and Lester Knapp, a couple raising three children in the 1920’s. Evangeline, a compulsive housekeeper who feels mightily unappreciated by her family, suddenly finds herself in the rare position of having to earn a living outside the home when Lester suffers a severe accident that leaves him paralyzed. Their roles reversed, both Evangeline and Lester find themselves much happier and productive. The story opens with Evangeline frantically scrubbing grease spots out of her wooden floor – grease spots left there when one of the children carelessly dripped grease off a dinner plate. In the middle of her scrubbing, she realizes she hasn’t seen nor heard her youngest son for hours. Her fear quickly escalates as she searches for and cannot find him. As the story cuts to the boy, we are treated to a look inside the mind of a two year old who mightily resents his mother’s interference in his life. The reader quickly becomes aware of the fear and near hatred this boy has for his mother, who is very Spartan in her treatment of the children. Shortly after the boy is found, the rest of the family returns home and Canfield Fisher quickly establishes the walking-on-eggshells existence the family suffers through around Evangeline. The chapter ends with a wrenching scene of Evangeline breaking down as she sees a new line of grease spots dripped off the dinner plates, once again marring her perfectly clean floor. We know immediately that this woman can barely contain herself, although she does and life goes on. Once Lester is injured, Evangeline goes to work and proves herself to be an uncanny and successful business woman. Lester, on the other hand, finds that he loves being home with the children and keeping house as best he can. We see the family grow from being completely dysfunctional to being as close to normal as they ever will be, yet their role reversal is looked upon as a trial and chore by outsiders. Both Lester and Evangeline recognize, although not to each other, that life is better with Evangeline working outside the home and if they have to go back to a conventional lifestyle, lives could be in danger. I don’t want to give away too much of this story, but will say read this. Although written in 1924, this could have been published in the 1950s, 1960s or 1970s, when women were taking so much flack for working outside the home. This would make an excellent book discussion selection, especially for groups with older men and women who lived through the times when this type of living arrangement was taboo. 4 out of 5 catalog cards.